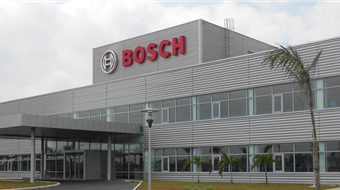 Bosch the German Automotive Giant which also has a presence in the Industrial and Engineering Sectors made an entry into the Solar Energy field buying up a German solar company Ersol a few years ago at the height of the solar boom. Bosch has a presence in other Green sectors like Energy Efficiency, Geothermal heat pumps and Water Heaters as well. Bosch Solar Energy is present in almost all parts of the solar supply chain and sells solar wafers, cells, solar panels, mounting systems as well is involved in the construction of a solar power plant as an EPC contractor. The company has sales locations in most places in the world taking advantage of its parent’s global footprint. Bosch started out into the Solar Energy field by making a very expensive acquisition of Tier 2 German solar company Ersol in 2008 for Euro 1.1 billion. Bosch paid a premium of 60% for buying out Ersol which was a manufacturer of wafers, cells and modules. The company paid a very price to buy Ersol which was a jack of all trades kind of solar company without any substantial competitive advantages. Bosch had set a target of Euro 750 million from renewable energy (don’t know whether they met it ). Bosch made a bad decision because at the current stock prices it can buy almost the entire German solar panel manufacturing sector for Euro 1.1 billion. Its doubtful that Ersol would have survived the current solar panel downturn and was extremely lucky to get bought by Bosch for that price. The company also bought two other small German solar companies at expensive valuations Aleo Solar and Johanna Solar (a thin film solar panel producer). It could have similarly bought these companies or even better companies at much cheaper prices. Bosch makes Solar Panels not only of the mainstream crystalline silicon type but also sells thin film solar panels which it acquired from Johanna. Bosch Solar Panels are of good quality being made in German factories where quality control is good. However, the cost and price factor is a problem as Bosch Solar Panels are much more expensive than the cheap solar panels being made by Chinese low-cost panel manufacturers. This is the reason that Bosch is being forced to move to Malaysia as European solar panel manufacturing is facing huge headwinds. The company sells monocrystalline solar panels made up of 60 solar cells. The company gives a 10-year product warranty with 25-year performance guarantee (90% up to 10 years, 80% up to 25 years). It is UL 1703 certified and IEC certified.It has 60 cells of 156 mm length and width with 235-240 watts of performance. The solar panels are of 5.2 feet length and 3.5 feet width with aluminum frames. Bosch Solar Panels sell at higher prices than other Chinese Solar Panels because of the higher cost of these German made panels. Bosch also has a lower variety of solar panels selling only monocrystalline solar panels which are higher priced though 240 Watt panels are not the highest in the class. Bosch panels can be found on retailer websites for $1.75-1.9/watt which is much on the higher side considering that Bosch is nowhere in the top 10 solar panel manufacturers in the world. A customer would be better off buying solar panels of good quality either from top rate US makers like Sunpower or Chinese modules like Trina Solar, Yingli Green Energy and others. Read more about the best and biggest solar panel manufacturers and Thin Film Solar Panel Suppliers. We are in the process of setting up 5 MW Solar power project. Want to know your cost of 1 MW capacity using your SPV penals and other equipment. Also want to know your requirments to set up Franchise in with you. Contacts in India required.